LEXINGTON, Ky. (Aug. 16, 2018) — Every summer all over America, family reunions jam park shelters, which rock with the sounds of laughter, the smell of fried chicken and the joys of good-natured ribbing among generations. One particular reunion took place this summer in Harrogate, Tennessee, a small community nestled against the Cumberland Gap National Park in the heart of Appalachia. On a sunny day in June, picnic tables groaned under the weight of endless foil pans filled with potato salad, barbeque, coleslaw and Ale-8 pound cake. Plastic tablecloths flapped in the breeze. Children giggled as an uncle snuck up behind an unsuspecting teenager and doused him with water. Not far away, toddlers romped in the splashpad fountains under the watchful eye of a doting grandmother. In one way, however, this reunion was very different. In a quiet corner of the park shelter, a knot of people collected around a picnic table. One woman asked reunion attendee Tim Keyes his family history as a second woman transcribed feverishly in a green binder. Tim's sister squeezed his shoulder sympathetically as Dr. Ed Kasarskis prepped Tim's forearm for a blood draw and a skin biopsy. When the procedure was complete, Tim hugged his nephew. "I did this for you, bud," he said tearfully — a reminder to those gathered that this reunion wasn't all fun and games. Dr. Kasarskis and his team thanked Tim for his commitment to the cause and moved on to the next person in line. Tim is part of a family that carries a gene mutation known to cause ALS, or Lou Gehrig's disease. ALS is a progressive neurological disease that affects the nerve cells in the brain and the spinal cord, eventually stealing from its victims the ability to walk, dress, write, speak, swallow, and breathe. Most ALS patients die within five years of diagnosis, and there is currently no cure. ALS has afflicted poets, athletes, scientists and politicians, including physicist Stephen Hawking, actor/playwright Sam Shepard, and of course major league baseball hall of famer Lou Gehrig, who gave ALS its second name. This gene mutation is particularly cruel because while the average age of onset for ALS is about 65, people with a mutation in the FUS gene — like Tim and members of his family — tend to get ALS in their 30's and 40’s. The impetus for this particular family reunion was to gather as much genetic material as possible to help Tim Keyes' nephew, who was diagnosed last year at the tender age of 34. Only 5 to 10 percent of all ALS cases are caused by one of more than 20 faulty genes but Kasarskis, who directs the ALS Multidisciplinary Clinic at the University of Kentucky, shares the belief of the larger scientific community that unlocking the mystery of one genetic form of ALS might provide insight into the other 90 to 95 percent of cases that have no known cause. Kasarskis has invested his entire career studying ALS. One of his early journal publications analyzed Lou Gehrig's batting average over time to establish the onset and progression of his disease. Kasarskis also helped lead the campaign to have ALS named a "service-connected illness" by the Veteran's Administration in 2008 (for reasons not yet understood, the risk of ALS is almost double for servicemen and women who served in the Persian Gulf War). The genesis of this reunion actually goes back more than 30 years, when Kasarskis was a young neurologist with a penchant for hiking the Appalachians. In 1984, Kasarskis saw an ALS patient from Ewing, Virginia, just across the Kentucky state line, who mentioned that several family members had died from what they were told was throat cancer, but whose symptoms — weight loss, progressive weakness, inability to swallow — matched that of ALS. About 10 years later, he saw a woman with ALS from Somerset, Kentucky. Kasarskis noticed that she'd been born in Ewing and asked about her maiden name and realized that she was related to his first patient. Not long after he treated the second patient, her son showed up in his clinic with ALS. Over time, as Kasarskis saw more ALS patients from the same geographic areas — which he was familiar with because of his love of hiking — he started to suspect that something genetic might be at play. This was before personal email accounts were widely used, if at all. Kasarskis amassed a messy pile of handwritten diagrams and notes in his effort to trace this family tree. "It was ridiculously old-fashioned," Kasarskis recalled, "and not terribly effective." He had to rely on word of mouth, phone calls and letters, taking several "Blood and BBQ" trips to Eastern Kentucky to meet family members and persuade them to share their DNA. That all changed in 2005, when Debby Taylor joined Kasarskis' team as a research assistant. Taylor was using Ancestry.com to trace her own family tree and thought to use the website to trace this FUS-ALS family too. 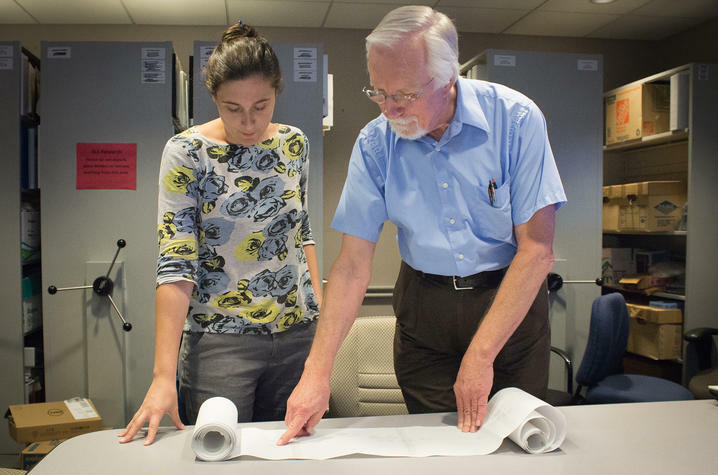 Within two weeks, she had amassed 20 pages of information dating back to the mid-1800's, which have been since been printed out and pieced together on a document fondly called "the Scroll." Taylor's work was so thorough that Kasarskis can visit with a new patient and recognize their name from the Scroll. It's not as easy as the websites make it sound, but once you get the hang of it, it's addicting, Taylor says. "Yes, there's that little leaf that's a clue, but it takes lots more legwork to establish a definitive link," she said. Taylor now accompanies Kasarskis on his Blood and BBQ trips, taking extensive family histories on each volunteer and transcribing the information into a green notebook for later cross-reference to the Scroll. The Scroll tells some astonishing — and heartbreaking — stories: the man without ALS who fathered seven children, three of whom were stricken. Of the four remaining healthy children, at least one produced a child who was diagnosed with ALS. According to Kasarskis, here lies the bigger question: why do some family members with the mutation get ALS while others are spared? Kasarskis hopes he'll find the answer by analyzing DNA samples from this family — and his Blood and BBQ trips are essential to gathering the genetic material he needs. On this particular June afternoon, Kasarskis stands on a picnic bench at the front of the park shelter, introduces himself and his work and beseeches the group to consider donating blood and skin to the cause. It's no small request since the volunteers won't be privy to their results. He answers their questions and reassures them that no one else will get their hands on their personal information — not insurance companies, not medical records. "This is between you and science," he says. Tim Keyes' stricken nephew, leaning on his walker to one side of the assembled group, is a subtle reminder of the request's urgency. Kasarskis tells the group that in other cases, one little breakthrough had "rocketed things forward" and that the answer to ALS could lie in this very shelter. A sizable number, effectively convinced that finding a cure requires their help and painfully aware that this disease is now taking another beloved family member, line up in front of Meg Bruno, the Kentucky Neurosciences Institute's ALS clinical research nurse, and Meha Joshi, Dr. Kasarskis' research coordinator, to fill out consent forms. Members of the extended family have donated $20,000 to underwrite the cost of whole gene sequencing for a handful of triad data sets comprised of a parent/carrier without ALS, a child with FUS-ALS, and a marrying-in parent. The genetic material will be sent to a lab in New York for analysis, where it will be first compared to data from a "standard" human genome and then to each other to identify genes that might function as a sort of light switch — either turning on the FUS gene in a way that causes ALS, or protecting carriers from coming down with it. Assisting with the science are UK biostatistician David Fardo, and Haining Zhu and Daret St. Clair from UK's Department of Molecular and Cellular Biochemistry, whose labs are dedicated to studying the FUS gene and potential treatments for illnesses related to FUS mutations. Because each of the afflicted children in the triads are distant cousins, the number of common genes they share is fairly small, giving this data set a unique pedigree that might yield tantalizing information on the road to a cure. Or not. Kasarskis points out that this exercise is based on a hypothesis that genetic modulation is at play. It might instead be an environmental irritant that spurs disease onset, which will require a whole new and challenging line of pursuit for answers. Either way, even a "no" answer is enlightening, he says. "This is all part of the quest in the life of science," he said. Dr. Ed Kasarskis and his research nurse Meg Bruno trace a family line on the "Scroll," a 200-page tome documenting a family who carries a gene mutation known to cause Lou Gehrig's disease.